In this tutorial we'll see how to centralize your business rules into a Business Logic Layer (BLL) that serves as an intermediary for data exchange between the presentation layer and the DAL. The Data Access Layer (DAL) created in the first tutorial cleanly separates the data access logic from the presentation logic. However, while the DAL cleanly separates the data access details from the presentation layer, it does not enforce any business rules that may apply. For example, for our application we may want to disallow the CategoryID or SupplierID fields of the Products table to be modified when the Discontinued field is set to 1, or we might want to enforce seniority rules, prohibiting situations in which an employee is managed by someone who was hired after them. Another common scenario is authorization perhaps only users in a particular role can delete products or can change the UnitPrice value. In this tutorial we'll see how to centralize these business rules into a Business Logic Layer (BLL) that serves as an intermediary for data exchange between the presentation layer and the DAL. In a real-world application, the BLL should be implemented as a separate Class Library project; however, for these tutorials we'll implement the BLL as a series of classes in our App_Code folder in order to simplify the project structure. Figure 1 illustrates the architectural relationships among the presentation layer, BLL, and DAL. Rather than creating separate classes to implement our business logic, we could alternatively place this logic directly in the Typed DataSet with partial classes. For an example of creating and extending a Typed DataSet, refer back to the first tutorial. Our BLL will be composed of four classes, one for each TableAdapter in the DAL; each of these BLL classes will have methods for retrieving, inserting, updating, and deleting from the respective TableAdapter in the DAL, applying the appropriate business rules. To more cleanly separate the DAL- and BLL-related classes, let's create two subfolders in the App_Code folder, DAL and BLL. Simply right-click on the App_Code folder in the Solution Explorer and choose New Folder. After creating these two folders, move the Typed DataSet created in the first tutorial into the DAL subfolder. Next, create the four BLL class files in the BLL subfolder. To accomplish this, right-click on the BLL subfolder, choose Add a New Item, and choose the Class template. Name the four classes ProductsBLL, CategoriesBLL, SuppliersBLL, and EmployeesBLL. Next, let's add methods to each of the classes to simply wrap the methods defined for the TableAdapters from the first tutorial. For now, these methods will just call directly into the DAL; we'll return later to add any needed business logic. If you are using Visual Studio Standard Edition or above (that is, you're not using Visual Web Developer), you can optionally design your classes visually using the Class Designer. 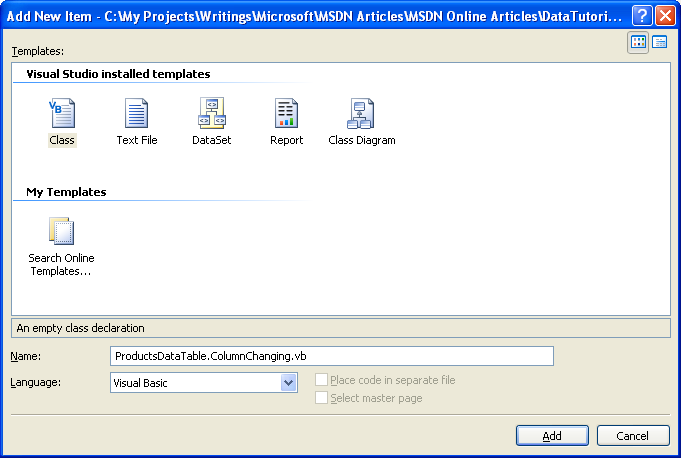 Refer to the Class Designer Blog for more information on this new feature in Visual Studio. The methods that simply return data GetProducts, GetProductByProductID, GetProductsByCategoryID, and GetProductBySuppliersID are fairly straightforward as they simply call down into the DAL. While in some scenarios there may be business rules that need to be implemented at this level (such as authorization rules based on the currently logged on user or the role to which the user belongs), we'll simply leave these methods as-is. For these methods, then, the BLL serves merely as a proxy through which the presentation layer accesses the underlying data from the Data Access Layer. The AddProduct and UpdateProduct methods both take in as parameters the values for the various product fields and add a new product or update an existing one, respectively. Since many of the Product table's columns can accept NULL values (CategoryID, SupplierID, and UnitPrice, to name a few), those input parameters for AddProduct and UpdateProduct that map to such columns use nullable types. Nullable types are new to .NET 2.0 and provide a technique for indicating whether a value type should, instead, be Nothing. Refer to the Paul Vick's blog entry The Truth About Nullable Types and VB and the technical documentation for the Nullable structure for more information. All three methods return a Boolean value indicating whether a row was inserted, updated, or deleted since the operation may not result in an affected row. For example, if the page developer calls DeleteProduct passing in a ProductID for a non-existent product, the DELETE statement issued to the database will have no affect and therefore the DeleteProduct method will return False. 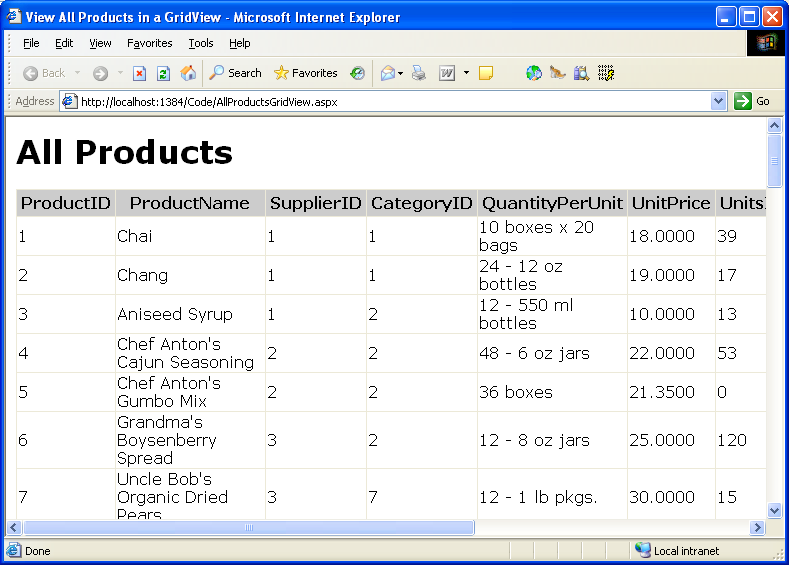 Note that when adding a new product or updating an existing one we take in the new or modified product's field values as a list of scalars as opposed to accepting a ProductsRow instance. 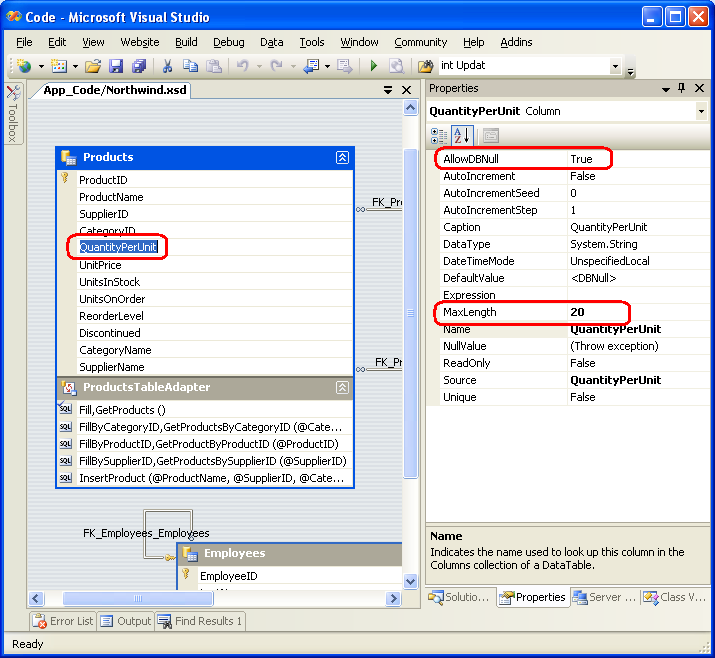 This approach was chosen because the ProductsRow class derives from the ADO.NET DataRow class, which doesn't have a default parameterless constructor. In order to create a new ProductsRow instance, we must first create a ProductsDataTable instance and then invoke its NewProductRow() method (which we do in AddProduct). This shortcoming rears its head when we turn to inserting and updating products using the ObjectDataSource. In short, the ObjectDataSource will try to create an instance of the input parameters. If the BLL method expects a ProductsRow instance, the ObjectDataSource will try to create one, but fail due to the lack of a default parameterless constructor. For more information on this problem, refer to the following two ASP.NET Forums posts: Updating ObjectDataSources with Strongly-Typed DataSets, and Problem With ObjectDataSource and Strongly-Typed DataSet. Next, in both AddProduct and UpdateProduct, the code creates a ProductsRow instance and populates it with the values just passed in. When assigning values to DataColumns of a DataRow various field-level validation checks can occur. Therefore, manually putting the passed in values back into a DataRow helps ensure the validity of the data being passed to the BLL method. Unfortunately the strongly-typed DataRow classes generated by Visual Studio do not use nullable types. Rather, to indicate that a particular DataColumn in a DataRow should correspond to a NULL database value we must use the SetColumnNameNull() method. In UpdateProduct we first load in the product to update using GetProductByProductID(productID). While this may seem like an unnecessary trip to the database, this extra trip will prove worthwhile in future tutorials that explore optimistic concurrency. Optimistic concurrency is a technique to ensure that two users who are simultaneously working on the same data don't accidentally overwrite one another's changes. Grabbing the entire record also makes it easier to create update methods in the BLL that only modify a subset of the DataRow's columns. When we explore the SuppliersBLL class we'll see such an example. Finally, note that the ProductsBLL class has the DataObject attribute applied to it (the [System.ComponentModel.DataObject] syntax right before the class statement near the top of the file) and the methods have DataObjectMethodAttribute attributes. The DataObject attribute marks the class as being an object suitable for binding to an ObjectDataSource control, whereas the DataObjectMethodAttribute indicates the purpose of the method. As we'll see in future tutorials, ASP.NET 2.0's ObjectDataSource makes it easy to declaratively access data from a class. To help filter the list of possible classes to bind to in the ObjectDataSource's wizard, by default only those classes marked as DataObjects are shown in the wizard's drop-down list. The ProductsBLL class will work just as well without these attributes, but adding them makes it easier to work with in the ObjectDataSource's wizard. Refer to this article's download for my complete implementation of the BLL classes. The BLL classes can also be accessed declaratively (as can the Typed DataSet) by using the ObjectDataSource. We'll be discussing the ObjectDataSource in greater detail in the following tutorials. These rules can and should be expressed at the database level. 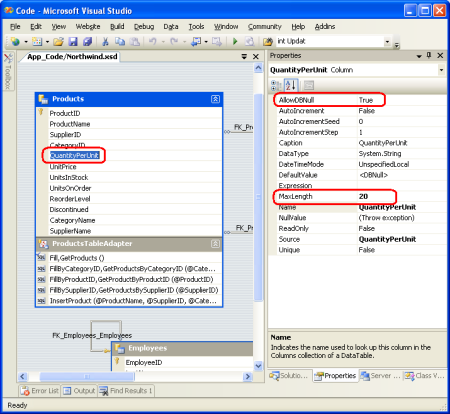 The character limit on the ProductName and QuantityPerUnit fields are captured by the data types of those columns in the Products table (nvarchar(40) and nvarchar(20), respectively). Whether fields are required and optional are expressed by if the database table column allows NULL s. Four check constraints exist that ensure that only values greater than or equal to zero can make it into the UnitPrice, UnitsInStock, UnitsOnOrder, or ReorderLevel columns. In addition to enforcing these rules at the database they should also be enforced at the DataSet level. In fact, the field length and whether a value is required or optional are already captured for each DataTable's set of DataColumns. To see the existing field-level validation automatically provided, go to the DataSet Designer, select a field from one of the DataTables and then go to the Properties window. As Figure 4 shows, the QuantityPerUnit DataColumn in the ProductsDataTable has a maximum length of 20 characters and does allow NULL values. If we attempt to set the ProductsDataRow's QuantityPerUnit property to a string value longer than 20 characters an ArgumentException will be thrown. Unfortunately, we can't specify bounds checks, such as the UnitPrice value must be greater than or equal to zero, through the Properties window. In order to provide this type of field-level validation we need to create an event handler for the DataTable's ColumnChanging event. As mentioned in the preceding tutorial, the DataSet, DataTables, and DataRow objects created by the Typed DataSet can be extended through the use of partial classes. Using this technique we can create a ColumnChanging event handler for the ProductsDataTable class. 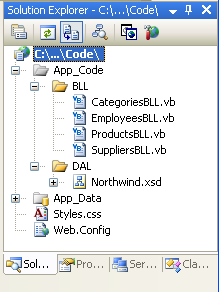 Start by creating a class in the App_Code folder named ProductsDataTable.ColumnChanging.vb. Next, create an event handler for the ColumnChanging event that ensures that the UnitPrice, UnitsInStock, UnitsOnOrder, and ReorderLevel column values (if not NULL) are greater than or equal to zero. If any such column is out of range, throw an ArgumentException. The BLL classes should contain checks to ensure adherence to the application's business rules. These checks can be added directly to the methods to which they apply. Imagine that our business rules dictate that a product could not be marked discontinued if it was the only product from a given supplier. That is, if product X was the only product we purchased from supplier Y, we could not mark X as discontinued; if, however, supplier Y supplied us with three products, A, B, and C, then we could mark any and all of these as discontinued. An odd business rule, but business rules and common sense aren't always aligned! To enforce this business rule in the UpdateProducts method we'd start by checking if Discontinued was set to True and, if so, we'd call GetProductsBySupplierID to determine how many products we purchased from this product's supplier. If only one product is purchased from this supplier, we throw an ApplicationException. As we'll see in future tutorials, handling exceptions that bubble up from the BLL when using a data Web control for inserting, updating, or deleting data can be handled directly in an event handler as opposed to having to wrap code in Try...Catch blocks. A well architected application is crafted into distinct layers, each of which encapsulates a particular role. In the first tutorial of this article series we created a Data Access Layer using Typed DataSets; in this tutorial we built a Business Logic Layer as a series of classes in our application's App_Code folder that call down into our DAL. The BLL implements the field-level and business-level logic for our application. In addition to creating a separate BLL, as we did in this tutorial, another option is to extend the TableAdapters' methods through the use of partial classes. However, using this technique does not allow us to override existing methods nor does it separate our DAL and our BLL as cleanly as the approach we've taken in this article. With the DAL and BLL complete, we're ready to start on our presentation layer. In the next tutorial we'll take a brief detour from data access topics and define a consistent page layout for use throughout the tutorials. This tutorial series was reviewed by many helpful reviewers. Lead reviewers for this tutorial were Liz Shulok, Dennis Patterson, Carlos Santos, and Hilton Giesenow. Interested in reviewing my upcoming MSDN articles? If so, drop me a line at mitchell@4GuysFromRolla.com.